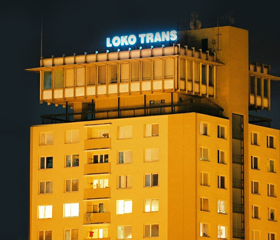 LOKO TRANS is a company with many years of experience in the field of trade and services concerning railway technology and transportation. To our customers and business partners, we offer the purchase, sale and lease of freight rail cars and locomotives. We also provide maintenance and repairs of rolling stock, including purchasing and selling of spare parts, as well as domestic and international rail transport and forwarding. Since 2007, in compliance with the EC Commission Regulation, LOKO TRANS has held several certificates, namely the “Carrier’s Certificate” issued by the Rail Authority in Prague, “Security Certificate” issued by the Railway Regulatory Authority in Bratislava and the Operator’s Licence to provide transportation services within European Union and European Economic Area. In the same year, our company was awarded the ISO 9001 quality management system certificate. Our long term goal is to offer our customers comprehensive services in rail freight transport, including the lease of carriages and locomotives and “all-inclusive” freight transport throughout Europe. Currently, LOKO TRANS has a fleet of several hundred railway wagons of various series and dozens of locomotives.